Size Height 242 mm, width 176 mm. Watermark Radiant sun in 44mm circle (form 1) . Watermark not noticed by Drake. Comments The folio is part of a larger sheet of paper combining the folios 76 and 77 . 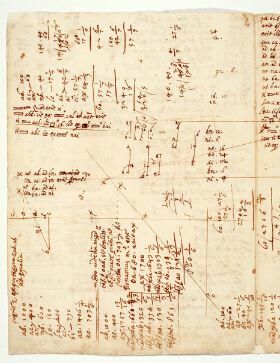 Written by Galileo; contains tables, short texts, drawings, calculations. Relation to the Discorsi: work on 2/34-pr-13. 2 Quia ut ab ad bn, ita ai ad in, erit, permutando, ut ba ad ai, ita bn ad ni. 3 Quaeritur z, ex quo tempora zab, ab sint aequalia. 4A Modo videndum numquid tempus per oab sit brevissimum, et primo qu[a]erere quantum sit posita oa 703 1/8.